Bully Beats up a Blind Student in School... But See Who Came in and Gave him a Dose of His Own Medicine! School bullying is a type of bullying that occurs in an educational setting. Bullying can be physical, sexual, verbal or emotional in nature. This may be more specifically characterized by an intention to harm someone and that intention suggests that the harm caused by bullying is deliberate, not accidental. Watch how this scene goes when a bully beats up a blind student in school, see who came in and gave him a dose of his own medicine! 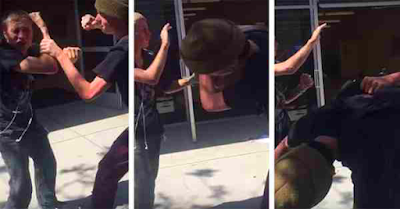 This shocking footage of the attack was filmed by a bystander, showing a 'visually impaired' student being repeatedly hit round the head during lunch break at Huntington Beach High School, California on Wednesday. The assault only ends when the high school student intervenes by knocking the bully to the ground with a single punch. He was hailed a hero in different social media sites.